Nintendo has announced another Nintendo Switch bundle for the holidays. The new Nintendo Switch bundle features Blizzard’s legendary game Diablo III: Eternal Collection, launching exclusively at EB Games stores in Canada on November 2nd. 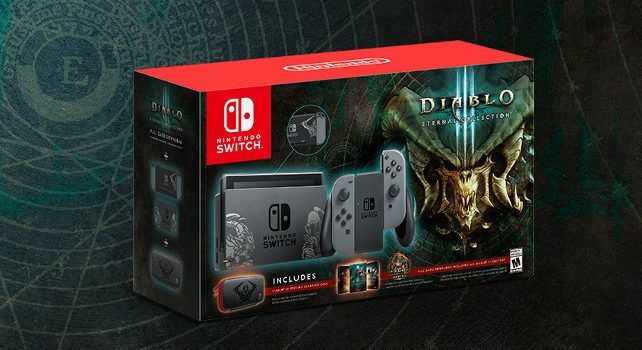 Fans who pick up the devilish bundle will receive a Nintendo Switch system and dock featuring Diablo III artwork, a download code for the Diablo III: Eternal Collection game and a themed carrying case, all at a suggested retail price of $449.99 CAD. Diablo III: Eternal Collection contains the full classic game, as well as all of its expansion content: Rise of the Necromancer and Reaper of Souls. In addition, fans who play the Nintendo Switch version will receive in-game items that are only available on Nintendo’s console. These in-game bonuses include a variety of items from The Legend of Zelda series, including Ganondorf Transmog Armor, a companion Cucco pet and a Golden Triforce Portrait Frame.